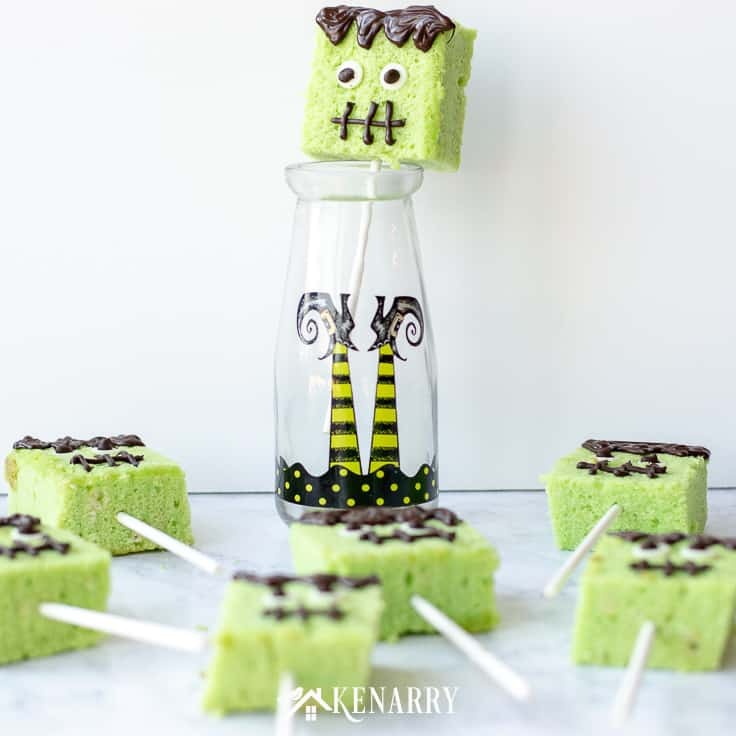 Create spooky Frankenstein Monster Halloween cake pops as a fun party treat on a stick. This easy dessert is a crowd pleasing recipe kids can help make too. 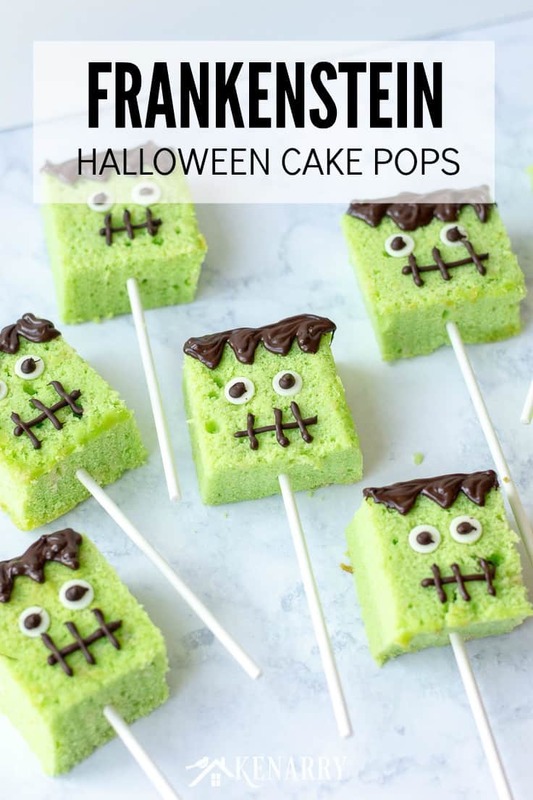 What could be better for Halloween night than Frankenstein cake pops? 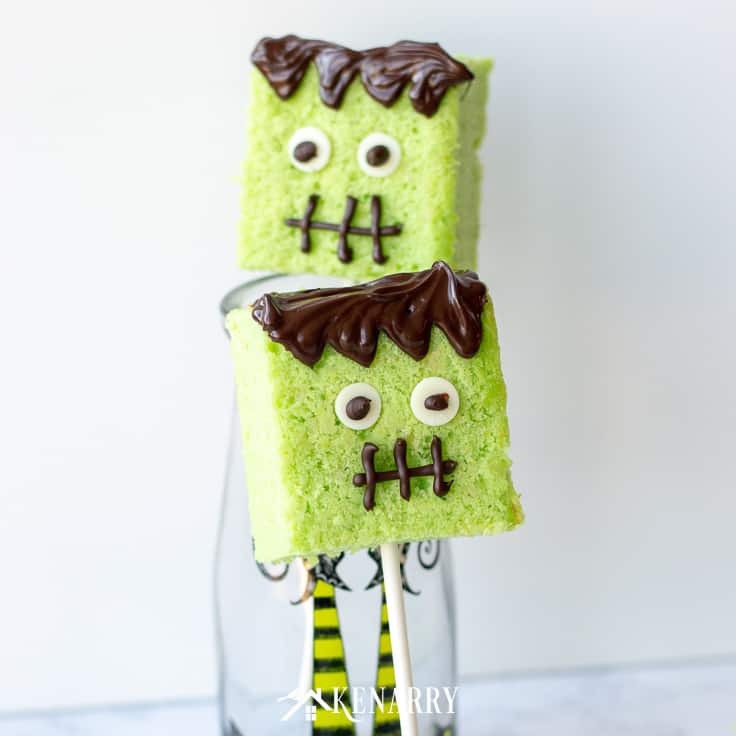 You can make them as a festive treat for a kid’s class party or an easy dessert to enjoy after you trick or treat from door to door. Today we’ll show you how to make these cute cake pops with a step-by-step tutorial. When Meaghan from Cook. Craft. Love. showed me these amazing Halloween Cake Pops she made for her Kenarry post this month, I was so excited. I love fun food ideas especially for holidays. Meaghan is incredibly creative when it comes to easy dessert ideas and Halloween is her favorite holiday so I knew she wouldn’t disappoint. For example, have you seen her Halloween Cupcakes decorated three different ways, her simple Halloween sugar cookies or her adorable Jack o’ Lantern Cookies? It’s truly no surprise that she outdid herself with these awesome Frankenstein cake pops. 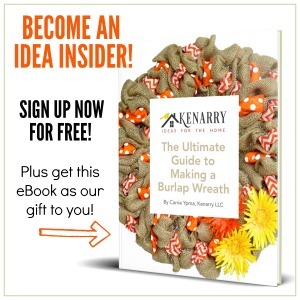 “These are so fun and SO simple that the kiddos can help make them from start to finish,” Meaghan said. To create the base for these Halloween cake pops, Meaghan uses a pound cake recipe. “My favorite pound cake recipe is from King Arthur Flour but you can use your own tried and true pound cake recipe.” She does warn, however, that you need to make a recipe designed specifically for a loaf pan or an 8 x 8 square pan. Do NOT use a recipe meant for a bundt pan. A bundt pan pound cake recipe will be too large. 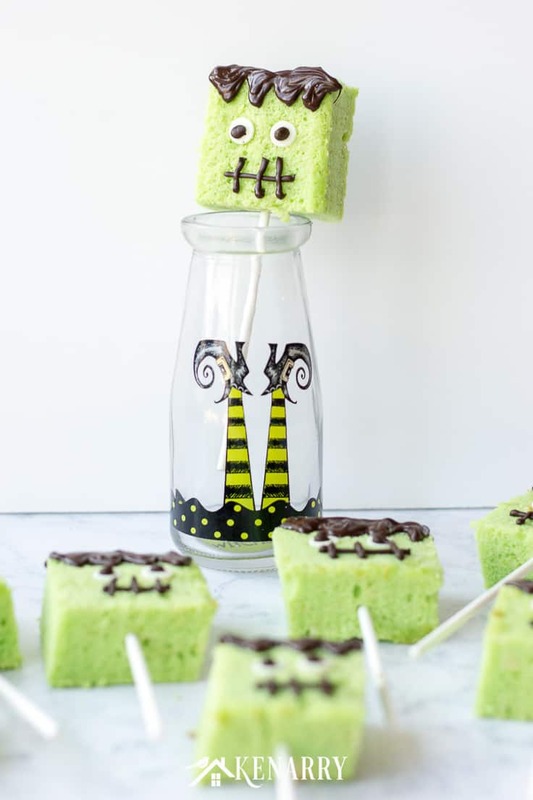 Create cute cake pops for Halloween with this easy tutorial. 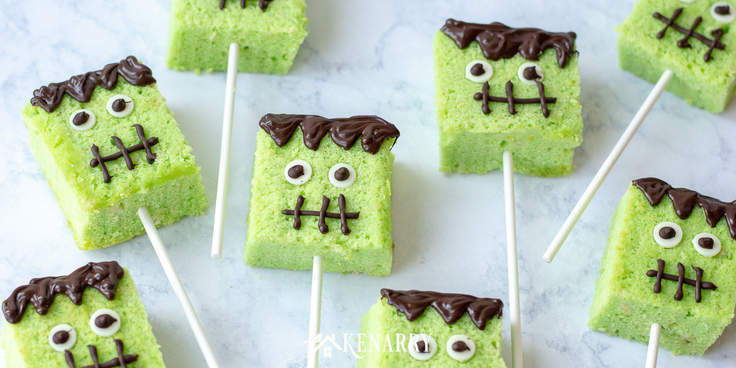 We’ll show you step-by-step how to make Frankenstein cake pops for a fun Halloween party treat. First, start by preheating your oven to 300 degrees F. Then lightly grease and line an 8 x 8 square baking pan with parchment paper. 2. Mix the pound cake batter. Next, get out your stand mixer or you can use a hand mixer, if you prefer. In a mixing bowl, beat together the butter, cream cheese, salt, sugar, baking powder, and vanilla extract until it’s well combined. Now you’re going to add the eggs to the batter. Add each of them one at a time, beating well after each of the five eggs is added. At this point, Meaghan warns that the mixture may look slightly curdled or grainy. Don’t worry. After you add the fifth and final egg, you’re going to beat the pound cake batter at high speed for three minutes. After all the eggs are incorporated, fold in the milk. Sift in the flour. Then fold it gently into the pound cake batter. Be very careful not to over-mix. At this stage, the batter for your cake pops should be thick but still able to be poured. 3. Dye the cake pop batter green like Frankenstein. Use food coloring to turn the cake batter your desired shade of green. Remember you’re making Frankenstein cake pops so you want the batter to be pretty green. Once the batter is green like a monster, spoon it into the 8 x 8 baking pan. Use a spatula to smooth the top and make sure it’s level. Bake the cake at 300 degrees for 40-45 minutes or until a toothpick inserted in the center comes out clean. 5. Cool and cut the cake. Let the cake cool in the pan for about 10 minutes. Then turn the cake onto a wire rack to let it finish cooling. Once the cake is completely cooled, you’ll want to trim any caramelization off the sides and bottom. At this point, you can level the cake if you notice any mounding on the top. Cut the cake into 9 equal squares. 6. Melt the 2 kinds of chocolate chips. Melt 1/3 cup dark chocolate chips in the microwave for 30 seconds, then stir. Continue to melt the chocolate in additional 10 second increments, stirring after each one, until the dark chocolate is smooth. Pour the melted chocolate into a disposable piping bag. Now melt white chocolate chips in the microwave using 10 second increments. Stir the chocolate well in between each increment until it’s completely melted. Meaghan warns, “be careful because white chocolate overheats and seizes VERY easily. Do this part slowly.” Use green food coloring to make the white chocolate match the same shade of green as your cake. 7. 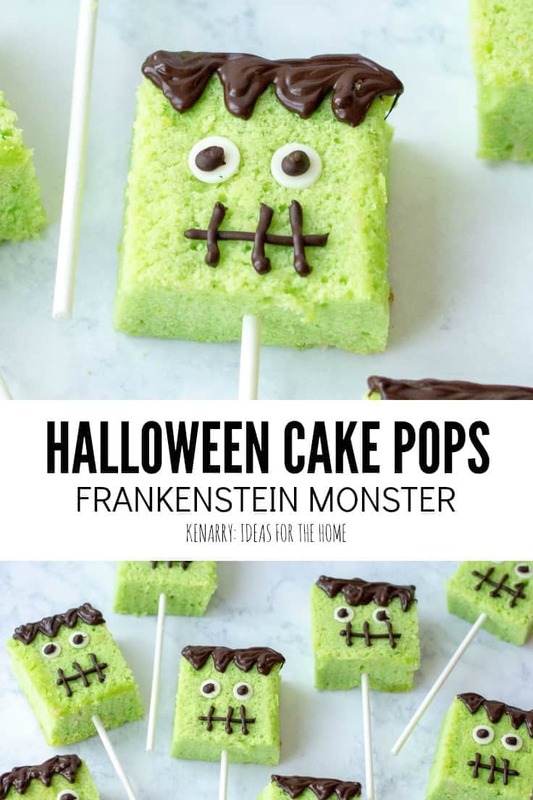 Create and decorate the Frankenstein Cake Pops. 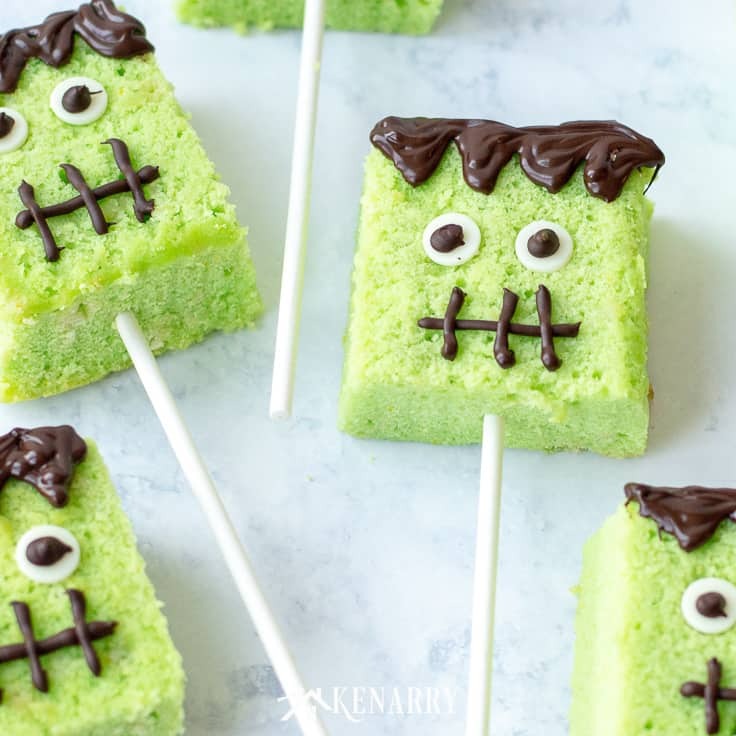 Now, take some extra unmelted white chocolate chips, turn them upside down and press them into the cake squares to make the base of Frankenstein’s eyes. Pipe a dotted circle of dark chocolate on top of the white eye ball to finish the monster eyes. Pipe the mouth and hair with the rest of the melted dark chocolate. 8. Serve the Halloween Cake Pops and enjoy! Allow the chocolate on the cake pops to set for at least 15 minutes. 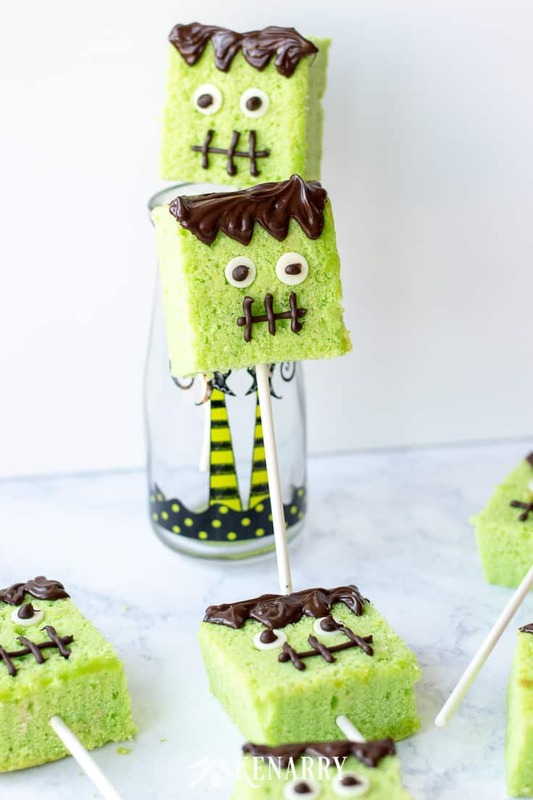 Now you’re ready to serve your Frankenstein cake pops. They’d especially go great with Boo-Nilla ghost milkshakes. Enjoy and have a Happy Halloween! 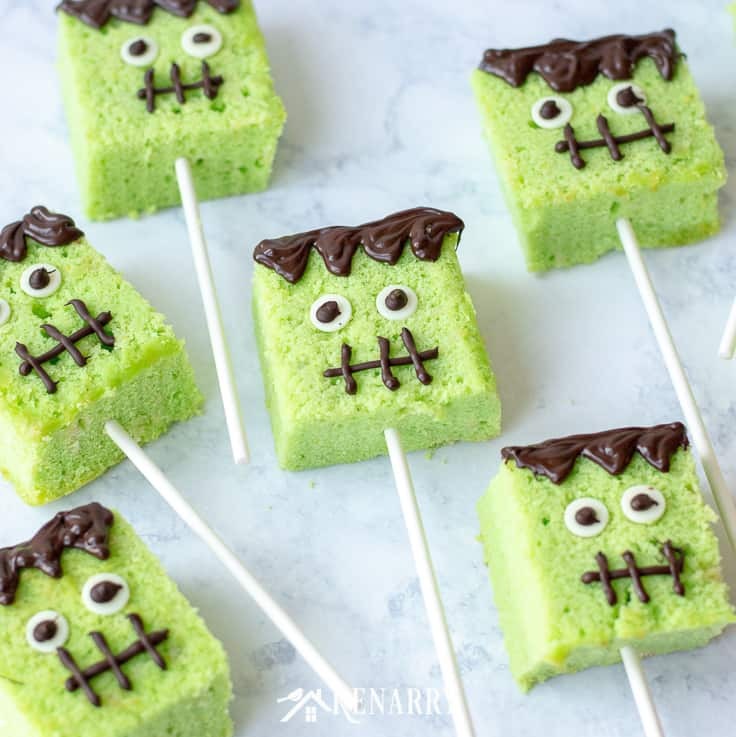 Frankenstein cake pops are a fun treat to make for a Halloween party. Use this easy recipe to make them as an easy dessert for fall. Preheat the oven to 300 and lightly grease and line an 8×8 square baking tin. In a stand mixer, beat the butter, cream cheese, salt, sugar, baking powder, and vanilla extract until well combined. Add the eggs one at a time, beating well after each; the mixture may look slightly curdled/grainy. After adding the final egg, beat at high speed for 3 minutes. After all the eggs are incorporated, fold in the milk. Sift in the flour and fold in gently, being careful not to overmix. At this stage, the batter will be thick but still pourable. Color the batter your desired shade of green and then spoon into the tin, leveling the top. Bake at 300 degrees for 40-45 minutes or until a toothpick inserted in the center comes out clean. Let the cake cool in the pan for about 10 minutes and then turn out onto a wire rack to cool completely. Once the cake is completely cooled, trim any caramelization off the sides and bottom and level the cake. Cut into 9 equal squares. Melt 1/3 cup dark chocolate chips in the microwave for 30 seconds, then stir. Melt in 10 second increments, stirring after each one, until smooth. Add the melted chocolate to a disposable piping bag. Melt white chocolate chips in the microwave in 10 second increments stirring well in between each one until melted. Be careful because white chocolate overheats and seizes VERY easily. Do this part slowly. Color it green to match your cake. Dip a lollipop stick into the green chocolate then insert into the cake pops and allow them to set until firm. You can speed this process along by sticking them in the freezer for 5 minutes. Then, take some unmelted white chocolate chips, turn them upside down and press them into the cake squares to make the base of the eyes. Pipe a circle of dark chocolate on top to finish the eyes. Pipe the mouth and hair with the rest of the melted dark chocolate, allow to set for 15 minutes.